Jasmine and Juliet went with their friend Elle to a paintball Bday party last week and they felt all ready for it!! But with this kind of attitude you can beat anybody! It's a real fun location called the Woods, check it out here, if you need a great idea for a Bday party! You need to drive through quite some adventurous path and even water to reach the location, so the drive to it is already fun! The Woods paintball place is located right off William Nichol in between Dainfern and the American school, so easy peasy to find! Another great day in Africa! As in the USA, the Hunger Games are really popular amongst kids and adults here in South Africa. The hype is not as big as in the US, but it is pretty 'IN'. So last week the kids had to dress up as a presenter or TV/Movie character. Juliet went as Rue, of the Hunger Games. The kids in her class made up a group of children who had read the book and each person took over a role from the movie. Some kids are not allowed yet to read the books or see the movie, but I saw the movie and think it is OK when it comes out on video for the girls to see it.... They LOVED the books! How about your kids, are they allowed to read the books and see the movie?? After our lunch we went to walk to a house where they were making the local beer called Umqombothi. 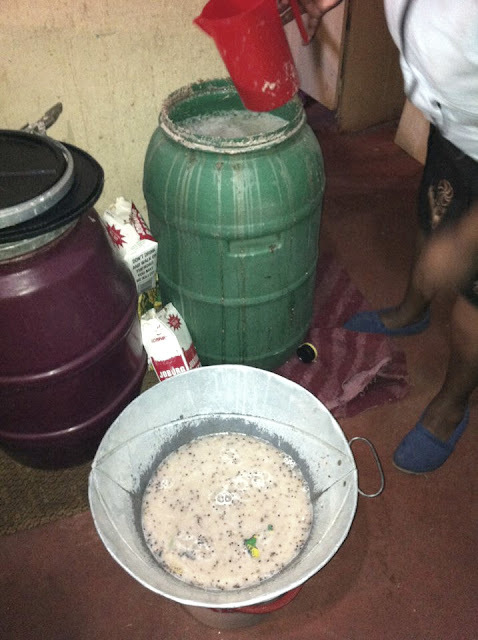 This is a traditional South African Beer made from malt, mielie meal (maize) and yeast. It is very high in vitamin-B and has a sour taste. But first a bit of a walk through Kliptown, which its lovely people! School kids on their way home. A nice day to hang out the laundry. Some local houses, some very colorful. Before we entered the house we saw some chickens laying around, it looked like they had no feet anymore, maybe these were the chicken feet we had for lunch?? We were invited in this grandfather's home, his daughter was making the beer. Here is the daughter making the Umqombothi in the kitchen, it was not ready yet, so we couldn't taste it... but I don't think any of us cared that much anyway. If you don't want to make it yourself, you can buy it in these tetra packs. Looks like a milk carton, but it has the beer in it. And the custom is to share one pack. I went once to a local cafe, called a Shebeen and we had it there. Not my kind of drink! By the way, do you recognize the song played in this video? It was used at the movie "Hotel Rwanda" and a song played often in African countries. The song is from a great African singer Yvonne Chaka Chaka. Africans love to sing and dance! This tradition of making the beer is still done today! Use a big open dish, mix the malt and mielie meal with the lukewarm water. Leave the mixture in a cool place overnight or until it tastes sour. Boil water in a pot, and pour the mixture into it. Cook for 40 minutes, stirring regularly. After cooking it pour the mixture in an open dish and allow to cool down. When it has cooled down, add more of the malt to the mixture and mix thoroughly. Add the Yeast, mix again and leave overnight. You can strain and serve it the following morning. What a great experience we had that day in Kliptown, see my previous posts about the Shwe Shwe poppies, the children in the Creche at the Feeding Scheme and our spectacular lunch! This was all done in one day.... just a day in our lives here in South Africa! I am grateful for all these experiences, it enriches our lives so much! After our wonderful morning at the Shwe Shwe Poppies house and the Creche we had another surprise waiting for us... a LOCAL lunch in Kliptown, another part of Soweto. Kliptown is home to the signing of the Freedom Charter, which was signed in 1955 by anti-apartheid activists, Kliptown holds a primary place in South African history. Today, Kliptown still struggles from lack of water, electricity, and housing, but efforts to sustain the local community and bring joy into the lives of the locals is an ongoing venture. We wanted a local lunch and for sure we got it!! This small restaurant looked almost like a museum, with tons of paraphernalia from all era's. Kitchen examples how it would have been for the reall poor to middle class people, very interesting to see. Inside, tons pots and pans, stoves of another era. Even an old stroller, typewriter and LP's with good ol' music. A real treat... we were looking forward to this local lunch that soon would be served! I loved his display of kitchen units from the olden days. Ubuntu is a concept in the Bantu language. It is about the essence of Humanness. Simply put: People are people, through other people. I am human, because I belong. Then after a welcome drink and talk we were served our lunch, buffet style. This food represents how the black South Africans eat. From the poor, to the middle class to the richer ones, we had it all at once. It was a huge spread! South African cuisine is often called 'Rainbow Cuisine' as it has had a variety of multicultural sources and stages. At first we were amazed at how much the owner of the restaurant would put out for us, dish after dish was put on this table and we all were so hungry, but then when we gave it a closer look... some of us were not that hungry anymore. We have one vegetarian in our group and she had a hard time looking at the dishes, but even us the ones who eat meat had never seen this! 3 Goats head boiled... I heard the cheeks are a delicacy and at first was willing to try, but how do you tackle this?? Some brisket in gravy, we know this one. Some salads, simple but yummy! Goats head... hmm not so sure, what part of the head was this?? Ting pap, a fermented kind of pap made from sorghum. Regular pap, made from corn meal, an everyday staple eaten with a flavorful stewed meat gravy like you saw above. And last but not least... boiled chicken feet! Our Fun Friday group although very hungry ended up not eating that much, mainly the pap and the veggies. Nobody was brave enough to tackle these new foods! And the owner of the restaurant told us later: 'Thank You for NOT eating!" I don't know if he meant it as a joke... or that he was indeed happy, since now he had so much food left over for sharing with others while we had paid for it. This was a great experience for us, we got to know so much more of the local eating habits and the struggles that the black people had to go through during the Apartheid. It was a memorable day for sure!! Thankful for the hospitality of the owner of the restaurant! We had such an interesting lunch!! Did you ever have an intersting lunch or where served some food that you never seen or tasted before? After the Shwe Shwe poppies (see my last blog post) we went to the Creche were the children are during the day, the ones who drew the poppies are bigger now and not at the centre anymore. But many other children are there and we were looking forward seeing them. Outside the centre we saw that many women were tending small plots of gardens, so there is more to this centre than meets the eye at first. There are in total 13 centres like this in SA and in total they feed 31 000 children from poverty-stricken homes are fed daily by ACFS. Many are orphans affected or infected with HIV/Aids – and this could well be their only meal of the day. Food is prepared at each of the 13 community centres. Children who go to school within walking distance of one of the centres come at break time or after school for their daily meal. Records are kept for each child – and failure to collect their meal acts as a warning that something may be amiss at home; one of our sisters will then call to check on the family at home. Communal vegetable gardens at each of the 13 centres encourage and teach women (and some men!) how to grow their own food. Each woman is given her own vegetable bed and is responsible for planting, weeding, watering and reaping – with help on hand if she needs it. Even though the beds are small, by planting three or four different types of vegetables in rotation, enough food can be grown all year round to feed an entire family. 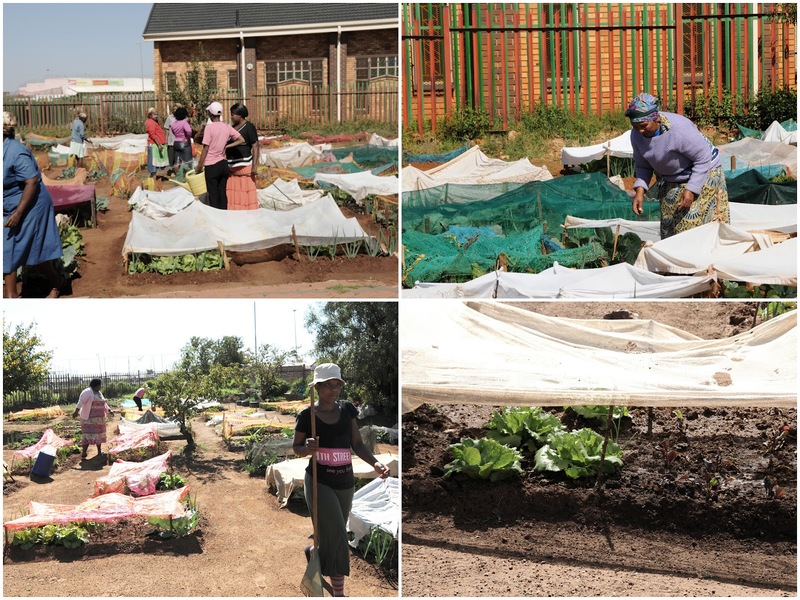 Once the women gain the necessary skills and confidence, they are encouraged to start their own vegetable patch at home. Surplus cabbages, potatoes and carrots can be sold to neighbours to earn a little extra income. We had a peek into the kitchen of the centre and today on the menu was Pap and Fish, from the cans you see on the table there. Simple but at least these children are lucky to have a warm meal a day! These children are left alone after the death of their parents: penniless, frightened and the centre takes care of these children. To see these precious faces it just broke my heart! They showed us some songs and dances they had learned at the centre and this is the song of the national Anthem, all with their hands on their hearts and in the air, so so cute!! Such a wonderful organisation, they do such good work! See their website of all the other things they do and maybe you like to help in one way or the other. Which is possible even if you live overseas! Now I want to even buy more Shwe Shwe poppies, so we can help these children! Next time I will visit them I also will bring them some lollipops, I so wished I had them with me when I saw all these precious faces, but we had no clue when we started this trip that morning we would come here. Next time I will be better prepared!! But the day was not over yet... now we were heading for a lunch of a life time!! We have a group of ladies who are part of this Facebook page 'Fun Fridays', so as the title suggests we do something FUN each FRIDAY. Well, last week we went to Soweto, one of the oldest and biggest townships here in South Africa and we went to the home of the Shwe Shwe Poppis in a part called Zola. 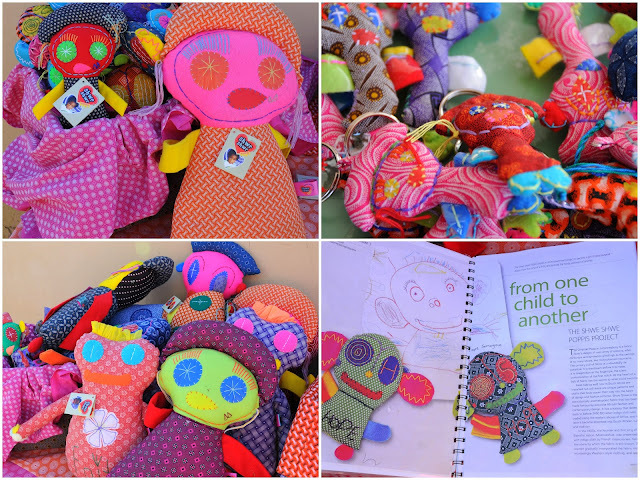 Remember that I talked about those cute little handmade dolls made of African Shwe Shwe fabric? I was and still am besotted about them!! See right below is a drawing from one of the children and then the poppi that is made according to that drawing, how cute is that?? If you like to read more about the Shwe Shwe poppis see here, here and here to refreshen your memory since it was way back in 2008 when I first discovered them! I always bought the fabric and poppies (dolls) in specialty stores, but this time we went with out Fun Friday group to the ladies who are making these dolls. Sitting at a kitchen table in a small house is where all the magic happens! We had so much fun and bought almost the whole inventory!! 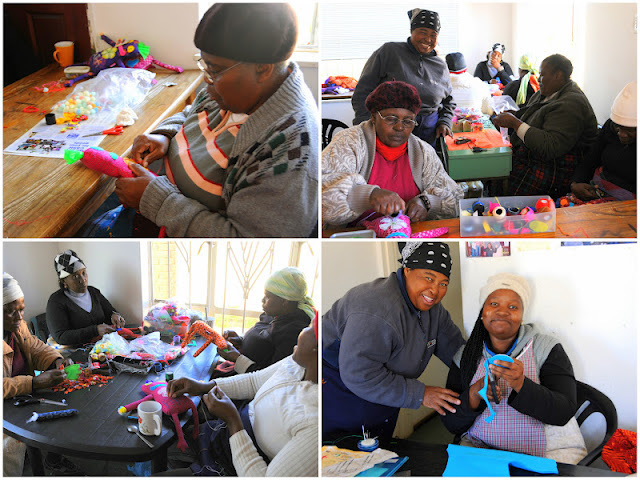 The ladies are sitting every day in a small house in Soweto sewing and creating these fab dolls one by one by hand. They kinda work in a sort of assembly line. One does the cutting of the fabrics and chooses the colors, then it goes to another person and she sews the body with a machine, then the doll goes to the lady who fills the doll with the stuffing, and then it goes to another lady who adds the detailing, stitching the eyes and other details like hair and eyes, ears etc.. on top of the dolls. So it goes at least through 4-5 hands before one doll is finished. the Fun Friday group with our purchases, happy as a kid!! Wandile is the general manager of the project, he was so nice to welcome and explain the program. It is truly a handmade doll, from the beginning till the end and the BEST part is that the doll is created by little boys and girls, they made the original drawing and from that drawing the dolls are made. It is totally cute, and such a great project! All the money that is made is going back to them! See below for the explanation of the program that I plucked from their website. These charming and imaginative fantasy figures are based on a series of original children’s drawings produced by the kids at the African Children’s Feeding Scheme’s Malnutrition and Rehabilitation Creche in Zola, Soweto. 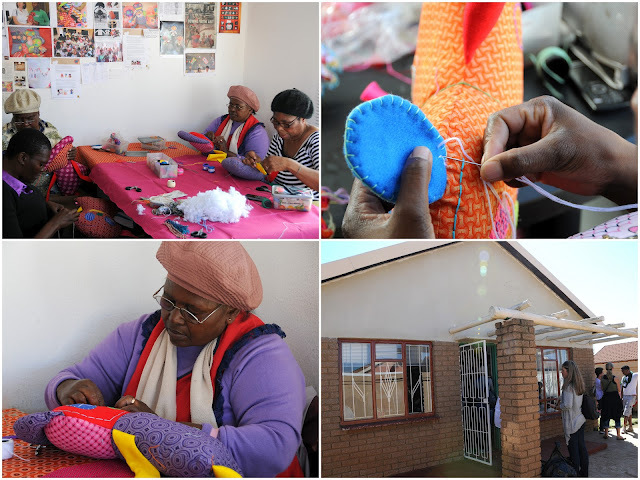 Lovingly hand-sewn by women from the community and inspired by stories from South African culture, these quirky, unique and sought-after creations are providing employment, education funding and a sense of pride and purpose for this Soweto community. After the buying we went off to see the children at the Rehabillitation Creche to learn more about their feeding programme (more about that another day), but then we had to quickly come back to the house before going to a local lunch (more about that too later, don't miss this one! it was an adventure), since 2 of our group of ladies bought dolls that were still in the making earlier that morning. Well, we came back with our van and the 2 quickly jumped out of the car to pick up their dolls, but the ladies at the house wanted to thank us all for buying so much poppies and a HUGE surprise was awaiting us!! Singing their hearts out for us! So much fun to see these ladies dancing and singing, we had a blast! All of us together, the dancing and singing brought us closer together! They lined us up in front of the house and started dancing and singing in this real AFRICAN way, it was amazing!! I was so humbled by their generous smiles, joyous singing and going out of their way to show us the dancing where the feet go high up in the air and stomping their foot on the ground, a traditional dance and song just to thank us! It was truly a magical experience to see these ladies, who are at least 50-55 years old and giving us this ritual dance. I instantly fell in love with these wonderful ladies and want to do more for them. These are the grandmothers or aunties of these young children who made the drawings and are trying to better their lives by sitting in this little house day by day hand sewing these dolls in hope for a better future for their grand children. This was just the beginning of a truly special day, we had more surprises to expect, but those need their own blog post. Keep watching this space... more exciting to come!